As always, an articulate expression from Shoshana Kessock of what the Paris shootings means for art, freedom, cultural development. Back in 2011, the offices of a French satirical magazine called Charlie Hebdo was firebombed. 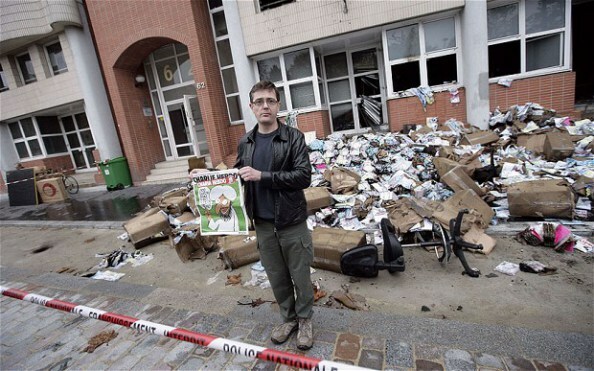 The picture above is of the magazine’s editor, Stéphane Charbonnier aka Charb, holding the reason for the attack: a cartoon they decided to print that depicted the Prophet Muhammad. By the laws of Islam, it is religiously prohibited to create a likeness of the Prophet in any way, and so the cartoon was considered sacrilege. The cartoonist, as well as any associated with the project, received death threats. The offices were fire bombed. And yet the cartoon was published anyway. It was joined in subsequent years by numerous other cartoons of Muhammad, each compiling the rage aimed at the Paris-based magazine.